Thermography Breast Screening and Natural Mammogram Alternative in Los Gatos, CA. We provide holistic, natural full body and breast screening using safe, non-invasive, no-radiation thermal scanning in Los Gatos, California. At the Los Gatos Breast Thermography Center we offer breast as well as full body thermal imaging for women and men. You will receive gentle and compassionate care which includes holistic counseling for optimal health and wellbeing. Should we see "hot spots" we will guide you towards the best remedies or the right health practitioner for your needs. Please contact Dr. Therese directly today at 408-583-7964 to schedule your appointment in Los Gatos and achieve the peace of mind that comes with early health awareness and prevention. Appointment times are limited and fill up very quickly. Please call Dr. Therese directly at 408.583.7964 to schedule your appointment in Los Gatos. We provide state-of-the-art thermal breast screening in Los Gatos, CA. Breast thermography is a painless and simple non-invasive, no-compression and radiation-free procedure that can alert your physician to health conditions that may indicate early stages of breast cancer or other disease. Breast thermography is FDA approved and has been shown to detect breast disease earlier than mammograms alone. 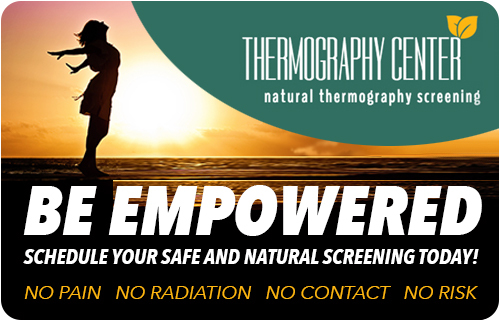 We provide full body thermographic screenings for men in Los Gatos, CA. Full body thermography is a state-of-the-art procedure that creates thermal images that capture heat patterns in the body’s physiology and can detect hidden health issues. We provide full body thermography for women in Los Gatos, CA. While focusing on breast health is vital, full body thermography seeks to uncover hidden health issues in other parts of the body from head to toe. Thermography makes it possible to be aware of our own health condition and show us which areas of the body to target. Contact Dr. Therese today at 408-583-7964 to schedule your appointment and achieve the peace of mind that comes with early health awareness and prevention.